In short, pulmonary edema is a condition where a person’s lungs are prone to filling up with fluid. Because of this, the body then struggles to get enough oxygen. Pulmonary edema is especially risky for people with heart problems. 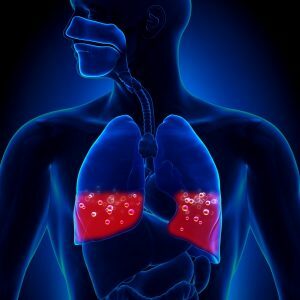 Treatment consists of medications, but there are also surgeries and procedures used to drain the fluid from the lungs. Timely treatment of the condition’s underlying causes improves a patient’s outlook. When Do Pulmonary Edema Symptoms Become an Emergency? Pallid, blue or grey skin. The first thing a healthcare team will do to a patient with pulmonary edema is introduce more oxygen to the system. They prop the patient up and deliver 100% oxygen through a nasal cannula or positive pressure mask to assist with breathing. If this does not work, the healthcare providers may insert a endotracheal tube, or breathing tube, down their throat for mechanical ventilation. Heart medications to control pulse and blood pressure. Suction catheter to remove fluid from the lungs. Pain relievers to make the experience more comfortable. Preload reducers to decrease fluid pressure in the heart and lungs. Pulmonary edema is a serious lung condition that often develops quickly and escalates to a medical emergency without much warning. If you are susceptible to pneumonia or expect to be exercising at a higher altitude in the future, you must be careful. Taking precautionary steps against pulmonary edema can save your life. Dr. Stacie Grossfeld of Orthopaedic Specialists, in Louisville, KY, is an orthopedic surgeon with a focus on sports medicine. She has over 20 years of experience treating athletic and non-athletic patients alike. If you feel you may be at risk of developing pulmonary edema, contact her today. Call 502-212-2663 or visit one of her two office locations to schedule an appointment.